On August 22, 2013 I wrote a post titled “The Impact Of Rising Interest Rates,” in which I discussed various wide-ranging impacts of the rising interest rate environment that I believe lack recognition. 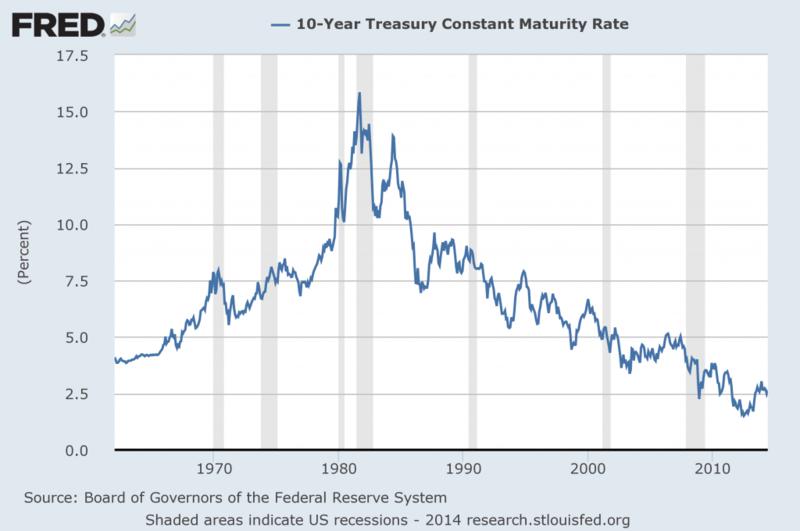 In this post, I would like to make additional comments regarding the future level of interest rates, and specifically the 10-Year Treasury Note yield. The November Wall Street Journal Economic Forecast Survey shows an average expectation of 10-year Treasury Note yields of 3.43% in December 2014 and 3.89% in December 2015. 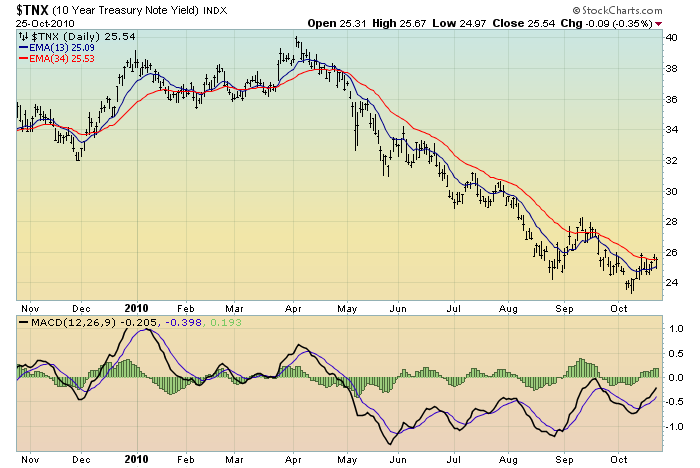 As well, many observers of interest rates have stated, due to either technical and/or fundamental reasons, that the 10-Year Treasury Note yield should peak at 3.5%-4.0%. While their reasoning and analyses for such a conclusion seems reasonable – if not compelling – my analyses indicate that interest rates will climb to far higher levels, with the outsized adverse consequences I discussed in the aforementioned August 22 blog post. Much of the potential for rising interest rates will be due to the “bursting” of the bond bubble. Many observers have dismissed the threat of rising interest rates, often for the reason that they believe a rising interest rate environment will be accompanied by a stronger economy; thus, by their reasoning, although there will be some sort of economic “drag” caused by rising interest rates, the “drag” will be largely, if not completely, offset by the concomitant strengthening economy. Although there are various areas which benefit from increased interest rates, from an “all-things-considered” basis rising interest rates have many problematic aspects for our current-era economy. While 10-Year Treasury Yields were above 5% as recently as 2007 – with no seeming adverse economic impact – I believe that the economy will have difficulties “absorbing” higher yields far before that 5%+ rate on the 10-Year Treasury is again reached. As well, my analyses continue to indicate that another financial-system “crash” of tremendous magnitude will occur. 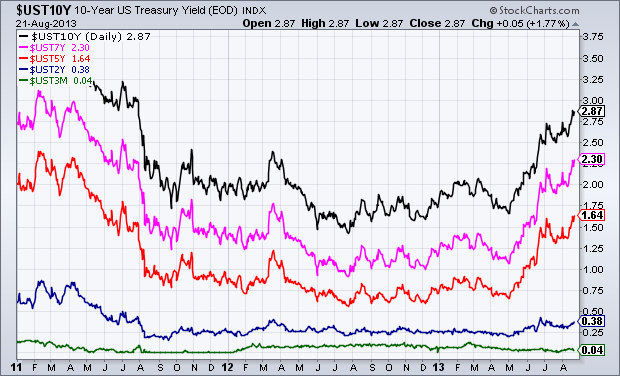 In this “crash” I expect that 10-Year Treasuries will not be the “safe haven” many believe them to be. This entry was posted in Bubbles (Asset) and tagged asset bubbles, bond bubble, bubbles, U.S. Treasuries on December 10, 2013 by Ted Kavadas. With the recent increase in interest rates, perhaps the paramount question is what impact a rising interest rate environment will have on the economy. 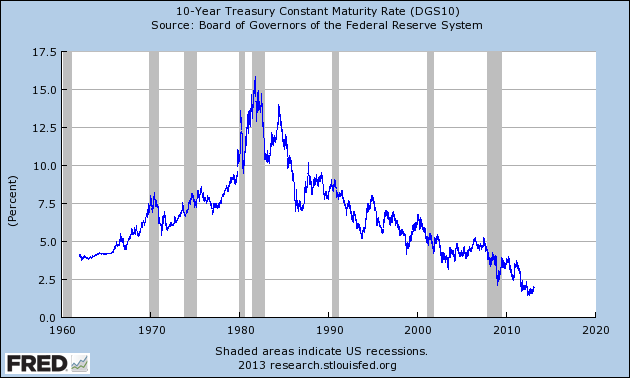 As one can see, the overall trend in interest rates has been declining, dating back to the peak seen in the early-80s. The impact of the recent rising interest rate environment is particularly noteworthy, not only because of the historically-rapid speed of its ascent, but also because, as I have commented before, my analyses indicate that interest rates can rise to levels much higher than generally expected. I have written extensively about my belief that there is an exceedingly large bond bubble; if one believes that such is the case, the implications concerning the level of future interest rates is disconcerting. A “deflating” or “bursting” of such a large bubble will have widespread negative impacts on the economy and markets. This entry was posted in Bubbles (Asset) and tagged asset bubbles, bond bubble, bubbles, U.S. Treasuries on August 22, 2013 by Ted Kavadas. 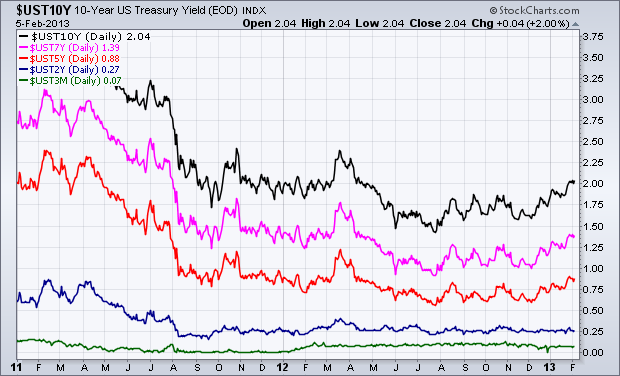 Since my last post on the Bond Bubble (the July 25, 2012 post titled “The Bond Bubble – July 2012 Update“) yields of various Treasury maturities have started to increase. In fact, even if one takes a view of interest rates from 1790-2011, one can see that the current era of ultra-low interest rates is very much anomalous. While this era’s ultra-low rates are not necessarily “proof” of an asset bubble in bonds, other characteristics, including those discussed in previous posts, very much indicate that a truly enormous bond bubble exists. While the duration of this “bull market” in bonds is outsized – and thus gives the appearance that ultra-low rates are not only normal – but such yields will remain depressed indefinitely – as with any asset bubble such seeming stability will prove illusory. In fact, there are already various indications that the bond market bubble has seen its zenith. Another critical issue with regard to the bond bubble is the following: If one believes that there is a bond bubble that is serving to unduly depress interest rates, what might be the “natural” interest rate – i.e. one that may endure after the bond bubble pops? This entry was posted in Bubbles (Asset) and tagged asset bubbles, bond bubble, bubbles, U.S. Treasuries on February 6, 2013 by Ted Kavadas. 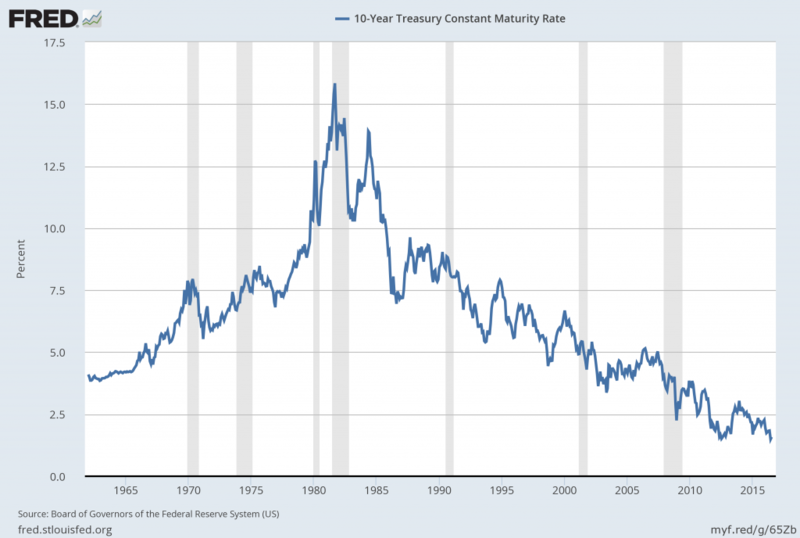 From an even longer-term perspective, looking at a 222-year chart of long-term interest rates, which uses the 30-year bond when available, one can also gain a perspective on today’s abnormally low yields. As seen on that chart, current yields on long-term interest rates have only been lower in one other time period in the 222-year history, with that other period being roughly 1940-1955. This entry was posted in Bubbles (Asset) and tagged asset bubbles, bond bubble, bubbles, U.S. Treasuries on February 21, 2012 by Ted Kavadas. The latest asset allocation survey from the American Association of Individual Investors (AAII) was just released, and it shows a continuation of an odd development. Investors’ allocation to stocks was unchanged at 55%, but they increased their allocation once again to bonds, while sacrificing their cash cushion. Their bond allocation jumped 4% to 25% of their total portfolio, while cash dropped 4% to 20%. The odd thing about it is that historically, there has been a very positive correlation between investors’ allocations to bonds and cash. Basically, it’s a “fear trade” – when they’re concerned, they pull money out of stocks and put it into bonds and cash. When they’re confident, they pull money out of bonds and cash and put it into stocks. But not lately. Over the past year and a half, the correlation has completely broken down, and investors are now using the bond market as their safe haven. When they reduce stock exposure, they put it into bonds, and not cash. Yes, the interest rate on cash is nearly nil. But it was also extremely low during periods prior to 2010, and yet the AAII folks still didn’t consider bonds to be the only safe haven. The thing that’s a little disturbing is that by using the bond market as a default safe haven, investors neglect to remember that long-term bonds do carry the risk of losing one’s capital unless held to maturity, which can be a very long ways off. Looking at the other sentiment indicators on the Bond page of the site, we can see a smattering of other extremes, like sentiment surveys and the positioning of traders in bond futures. Put/call ratios are exceptionally low, but they have been an inconsistent predicator of future market performance. Rydex traders have seemingly given up trying to time that market. This entry was posted in Bubbles (Asset), Investor and tagged bond bubble on October 8, 2010 by Ted Kavadas.